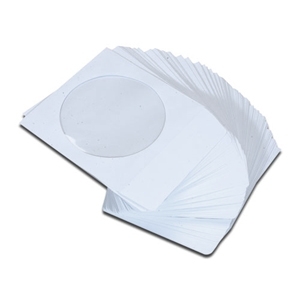 The iMBA CD sleeves protect your data from dust and dirt, and are economically priced. Windowed envelopes with non-stick flaps protect and store CDs, whilst offering a convenient space saving storage option. Use it to protect, store, mail and index your CDs. These sleeves fit all standard and MINI 80mm CD,DVD, and Blu-Ray media. These sleeves are also moisture and tear-resistant. Clear Polypropylene window for easy identification. Sleeve size approx. 5" x 5" plastic window is 4" in diameter.